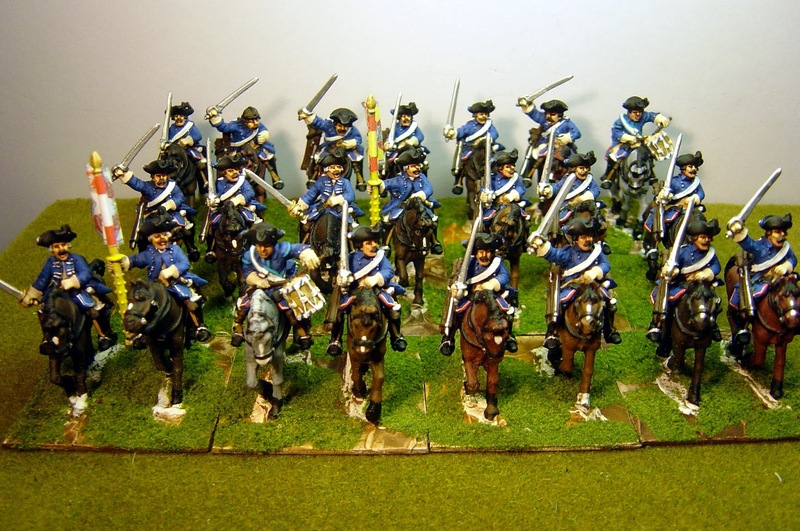 I'm painting eight packets of Foundry Prussian SYW Dragoons of which two are command packs and the rest made up of codes SYWP045,046 and 047. I've taken away the riders which are, generally speaking, crisp sculpts without too much flash. But look at these horses. Clearly the horse moulds are shot but any questions to this company about this elicits the response “a little bit of flash is necessary to the manufacturing process”. This is from the new management of this company who, by their own admission, have been in this hobby “just a couple of years”. Considering the fact that Foundry have, traditionally, been excellent with hardly any flash, the fact that they are on the expensive side, the fact that the management are trying to pull the wool over my eyes, what do you have? I'll leave you to made the correct inference. I will no longer be buying from them and I am just painting Foundry stuff that was bought last year and which needs finishing. How the great have fallen into an abyss of mediocrity garnished with bald-face lies and a poorly concealed contempt for the customer! 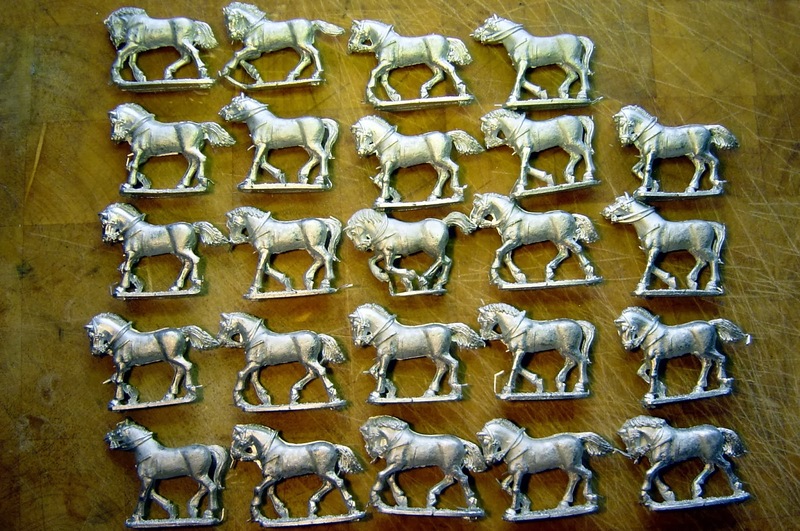 Oh, and on a practical note, these horses have taken about an extra 5 minutes each to clean up or an extra 2 hours work for the regiment. Some of them have legs fused with metal (they are 25/28mm not 15mm) and I've had to use an electric hobby-drill to drill out the space between them. 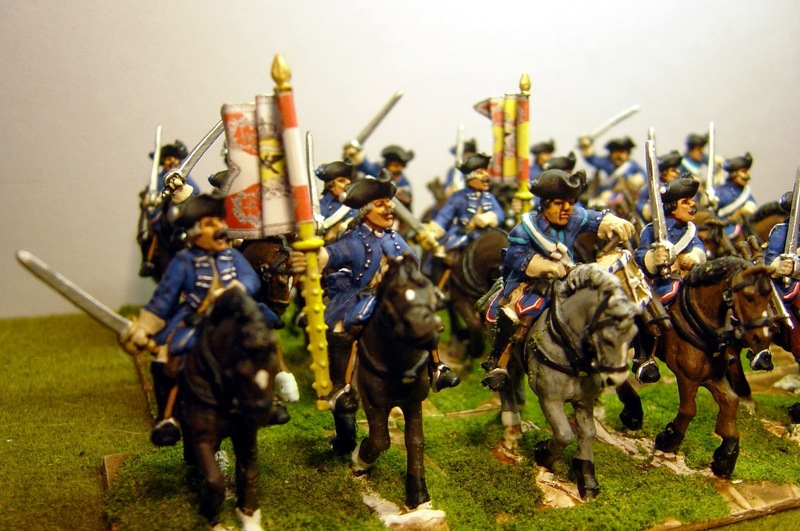 So, to the regiment itself - the 9th Prussian Dragoons of Georg Ludwig, duke von Holstein Gottorp. This unit spent much of it's time in service with the Allies in the Western Theatre and was present at the Battle of Minden. It has an unusual uniform in that it does not have a facing colour as all turnbacks and cuffs are in the coat colour. 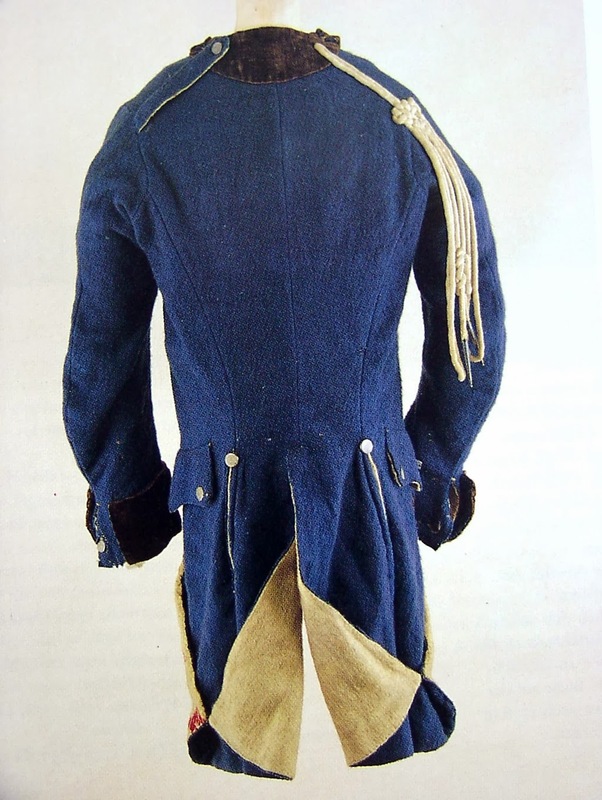 I've also shown an extant and original coat as an indication of the coat colour which Kronoskaf describes as 'Cobalt blue' and which is much darker than often depicted. I'm not sure how these will photograph (blue being a tricky colour to take) but they are painted the correct shade. As you probably know I use a lot of Coat d'arms paints and here I have used 110 Royal Blue as the undercoat and 148 Marine Blue as the highlight. There are 22 figures so that the regiment can either be fielded as one or split into two smaller units depending on the rules used. Well, you could use Minden Miniatures and never have to clean off any flash ever again. We use Griffin Moulds, who are the best casters, bar none. I take it as a point of pride that my figures do not have flash or any of those annoying venting spiders at the tip of ever protrusion on the figure. And with flat rate shipping of $10 per order regardless of weight, you get a pretty good value. I can second that. 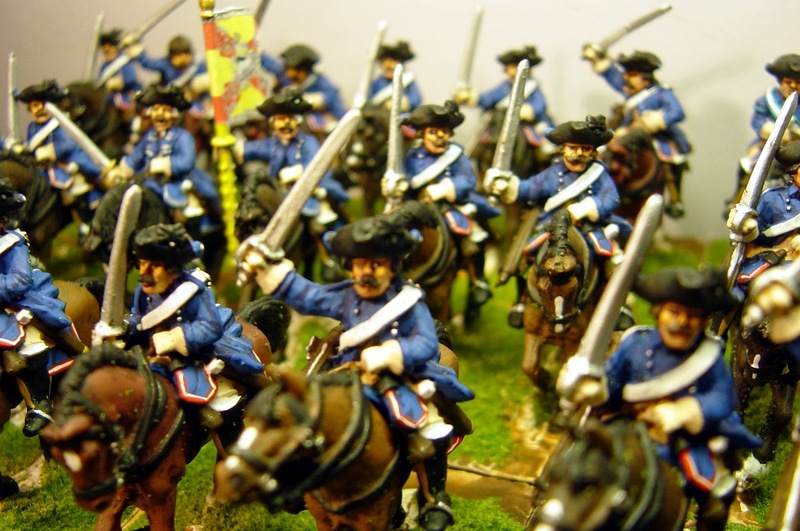 Bought some Prussian grenadiers last year. Sublime! Jim, I know, I know!! But I'm in too deep with 25/28mm and Mindens are too thin, or correctly proportioned you would probably say. For my own collections I will use either Crusader or Black Hussar. I think it's sad how low Foundry have sunk actually. Crusader are a good alternative to Foundry. Both ranges have similar chunkiness to them. I like Black Hussar figures too. They are very nice castings.